Southern Pacific’s OAKLAND PIER in the 1950s… The Oakland Long Wharf, later known as the Oakland Pier or the SP Mole was a massive railroad wharf and ferry pier in Oakland, California located at the foot of Seventh Street. The pier began as a smaller landing called Gibbon’s Wharf extending from Gibbons Point, later renamed Oakland Point, westward into San Francisco Bay. In 1868 the Central Pacific Railroad acquired this pier which it renamed the Oakland Long Wharf and immediately began extending and improving. The CPRR floated freight to San Francisco starting in 1871. Part of the wharf was filled in between 1879 and 1882, creating a mole. Local commuter trains also used the pier, while trains of the Pacific Railroad (aka the “First Transcontinental Railroad”) used another wharf in nearby Alameda for about two months in 1869 (September 6 – November 7) after which the Oakland Long Wharf became the western terminus of the Pacific Railroad as well. From there ferries carried both commuters and long distance passengers between the Long Wharf and San Francisco. The California Zephyr arrives from Chicago in 1950. The Central Pacific’s operations were consolidated under the Southern Pacific in the 1880s, and in 1882 the Oakland Pier was opened about a half-mile east of the west end of the Long Wharf which was then used only for freight until being abandoned in 1919. After January 15, 1939 electric commuter trains no longer ran to the Oakland Pier but instead used tracks on the San Francisco-Oakland Bay Bridge to the Transbay Terminal in San Francisco. Intercity passenger trains continued to run to Oakland Pier until 1958 when Southern Pacific ferry service from the Ferry Building in San Francisco to Oakland Pier was discontinued, replaced by buses over the Bay Bridge from Oakland’s 16th Street Station. A local train has just arrived during in the 1950s. The Oakland Mole will soon be history. Throughout the pier’s existence, progressively greater portions of the bay shore tidelands were filled in. It was demolished in the 1960s to make way for an expansion of the burgeoning Port of Oakland’s container ship facilities. Today, the only thing that remains of the SP Mole is the pier’s switchman’s tower which was moved and restored as part of Middle Harbor Shoreline Park. SOUTHERN PACIFIC’s OAKLAND PIER – The MOLE that moved the West! The Western Division of the Southern Pacific Railroad, historically extending from Sacramento to Oakland and San Jose, and with lines to Fresno, the Napa Valley, and over Altamont Pass, was a crucible of California operations. Headquartered at the famous Oakland Pier (or Mole) and dispatching hundreds of passenger and freight trains daily in its heyday, this division was in many ways the vortex of SP in the West. With its ferry connection to San Francisco and train departures to all parts of the SP system, the Oakland Pier was at the center. 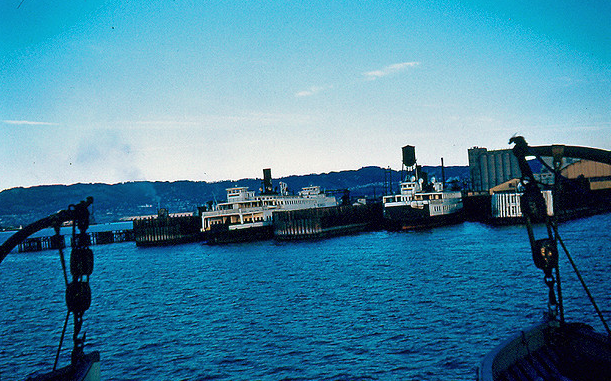 (Left: Passengers arriving at the San Francisco Ferry Terminal) At Oakland Pier, the deep whistles of ferries mingled with the barking exhausts of steam locomotives. At the end of track under the train-shed at Oakland Pier, the Overland Trail carved out by trappers and the Donner Party, and made permanent by the transcontinental railroad, reached its final terminal at tidewater. Oakland Pier opened for passenger service to the general public on January 22, 1882, when most of the West was a vast wilderness and railroading was an adventure for the passenger and the train crew as well. Announcements were sent out far and wide; special trains were run from outlying points around the Division into Oakland. The Southern Pacific Commissary Department provided over one hundred roast turkeys and mountains upon mountains of fluffy white mashed potatoes, along with some side dishes. It was truly a meal for a Queen. The City of Oakland was clearly becoming the western operational hub of the Central Pacific, and further improvement of the Oakland terminus was in order. Construction work of the “Oakland Mole” commenced during June 1879. The fill, or “Mole,” was constructed to a point 1.26 miles westerly from the Oakland shoreline. Rock for the fill was hauled from Niles Canyon, a distance of more than 26 miles, and earth from East Oakland. Four tracks and a carriageway were provided for over the first 4,860 feet. Beyond this point, the Mole widened out to 280 feet, accommodating 12 tracks, ten of which were within a large train shed at the end. The greater portion of the embankment and rock protection wall was completed in time to allow construction work to start on the new passenger station, railroad offices, and train shed early in 1881. The building was designed by Arthur Brown, superintendent of bridges and buildings for the company. Both the wharf and station building were erected under his supervision. The Oakland Pier building was constructed with three main longitudinal divisions. The center part was 120 feet wide, and 60 feet high and accommodated overland trains, and the divisions on either side were 60 feet wide and 40 feet high, being exclusively for suburban trains running to and from Oakland, Alameda, and Berkeley connecting with the ferry steamers. Two commodious waiting rooms for passengers were at the west, or the main end of the central section. The upper, or main waiting room, 120 feet square, was connected by side aprons with the saloon deck of ferry steamers, and the lower waiting room, was connected by end aprons with the main deck of the ferries. In 1929, the official Southern Pacific “Sunset” logo, some ten feet in diameter and made entirely out of stained glass, was placed high up on the westerly end of the big train shed, overlooking Passenger Slip No.4. The pieces of stained glass were held together by strips of lead. When the Mole was demolished in the 1964-66 period, the logo was very carefully removed and stored for preservation. Today you can see this beautiful memento from the Oakland Mole at the California State Railroad Museum in Sacramento. It is preserved and displayed in the original framework. The Mole also contained a restaurant and division offices. The train shed, 1050 feet in length, covered an area of over four acres and was constructed mainly of wood and iron. As originally built, the corrugated iron roof was divided into large sections of glass which gave abundant light during the day. At night the building was illuminated with electric lights. A terminal of importance, such as Oakland Pier was becoming, required support facilities in the form of freight and coach yards, shops and engine terminals. Central Pacific established its yards and shops west of Peralta Street, from 7th Street to the water’s edge leading to the Mole. 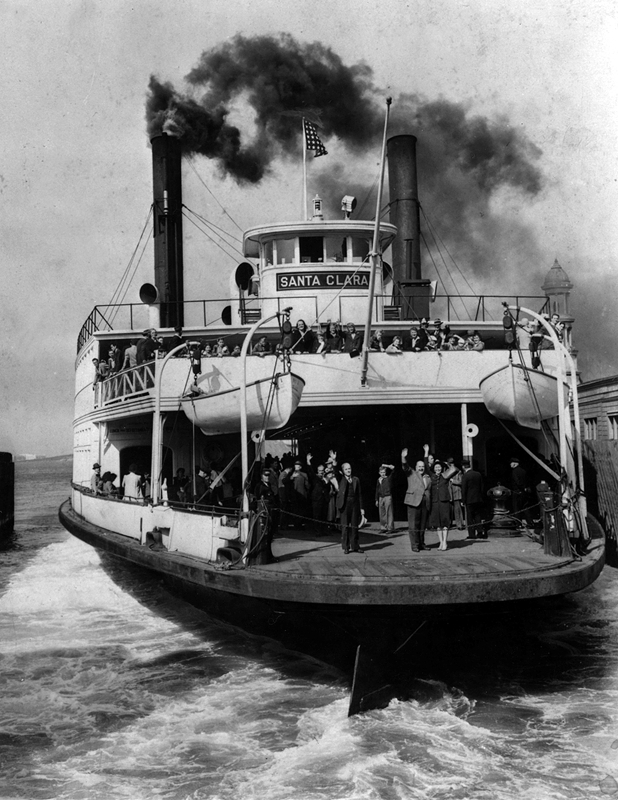 Over a 24-hour period in 1920, Oakland Pier handled an average of 763 main line and suburban passenger trains, and 56,000 passengers with connecting ferry service operating between San Francisco and Oakland Pier. The delightful eighteen-minute trip across the bay, with its invigorating ocean breeze, was also a welcome climax to a cross-continent journey. All this, combined with the tremendous flow of baggage, mail, and express, qualified Oakland Pier as one of the busiest terminals in the United States. During the period of Federal control (United States Railroad Administration) which lasted from August 18, 1918, through December 5, 1920, the passenger trains of both the Western Pacific and the Santa Fe were operated in and out of Oakland Pier. The Santa Fe trains operated from Santa Fe Junction near Richmond, a distance of 10.6 miles, and their equipment, both cars, and locomotives, were taken care of in SP’s West Oakland yard. This arrangement placed quite an additional burden on Oakland Pier terminal as well as the West Oakland roundhouse and passenger yards. To the Western Division fell the duty of providing terminal accommodations at Oakland Pier for the long trains that descended on the Bay Area from every section of the United States. Also, an exceptionally heavy summer vacation and tourist movement, particularly during the period June 19 to July 10, 1920 reaching a climax during the holiday period over July Fourth, combined with the Mystic Shrine Convention and Rose Festival at Portland, and the National Democratic Convention at San Francisco, placed considerable strain on the system. Under the most favorable conditions such a concentration of travel would have presented its difficulties from an operating standpoint, but at this time the Southern Pacific faced a shortage of equipment due to lingering effects of the period of government control (USRA). Between the hours of 5 AM June 26 and 4 AM June 27, 1920, 393 passenger cars moved out of Oakland Pier and 533 others entered the Pier. It was also found necessary to double some yard crews at Oakland to handle the influx of cars at Oakland Pier, switching them into the yards for cleaning and overhauling as required and the subsequent readying for other movements. In one twenty-four hour period on June 26, 1920, some 1,320 trucks of baggage, mail and express were ferried between Oakland Pier and San Francisco, most of it concentrated at rush hours. During this period of heavy traffic, each day some 35,000 pieces of linen were used in stocking the dining cars for a start at West Oakland. And the following supplies, among others, were issued from the West Oakland Commissary: 2000 pounds of butter, 1500 dozen eggs, 1650 loaves of bread, and two and one-half tons of fresh meat. Incredibly, even with this rush of traffic, the record number of cars handled at West Oakland terminal, some 53,000 freight, and 24,000 passenger cars occurred later, during August 1920. Over an average twenty-four hour period in 1920, Oakland Pier Terminal was handling 763 mainline and suburban passenger trains, and 56,000 passengers. Also, 3500 pieces of baggage, 7000 bags of mail and 100,000 pieces of express matter passed through the terminal every day. The ferry service between San Francisco and Oakland Pier at eighteen to twenty minute intervals was also an important feature of the vast suburban traffic that moved between the East and West Bay districts. The record number of passengers carried over this route in a twenty-four hour period at the time was 195,000. The ninety steam passenger trains using the terminal comprised of six hundred and fifty cars. Nine passenger trains left Oakland Mole in the space of an hour and a half in the morning and thirteen arrived in the space of two hours in the evening. The average number of switching movements made in Oakland Pier Tower was 1,900 and under emergency conditions would run as high as 2,100. From seventy-nine to eighty-three switching movements an hour, or over one a minute, qualified Oakland Pier as one of the busiest terminals in the United States. The old Oakland Long Wharf had been abandoned for all business in February 1919 and the new Southern Pacific Wharf, designed to accommodate 24 deep-water vessels at one time, was also located at Oakland Pier and handled an enormous tonnage of a diversified character. These freight slips were located on the south side of the Mole consisting of three wharves driven at an angle with the bulkhead line 875 feet long. Fifty vessels a month were being unloaded at these wharves, carrying from 75,000 to 500,000 board feet of lumber. Tracks were so arranged on the lumber wharves that transfer could be made directly from boat to car. An average of 2000 carloads a month, including all classes of freight, was being received or shipped over these wharves. The wharves were fully protected by the fire tug “Ajax” and by a high-duty saltwater system. More on this saltwater fire protection system in a moment. The terminal yard consisted of five double-track main lines. Also, there were thirty other tracks in the Oakland Pier terminal layout used for incoming and outgoing main line and suburban trains, storage of cars for both classes of service, an outlet track for incoming locomotives, industry tracks, and one assigned for traffic between the freight slip and West Oakland Yard. Tracks 1 and 2 and 7 and 8 constituted the two arteries through which the major portion of the tremendous traffic handled by this terminal passed. Oakland Pier Interlocking plant was equipped with a 155-lever Union Switch and Signal Company electric, pneumatic machine, in charge of a supervising Bowerman, two chief toweman and six levermen. Three men were on duty from 6 AM to 10 PM and two men from 10 PM to 6 AM. On August 26, 1920, a total of 2,177 switching movements were made by this plant, a record equaled by a few similarly located layouts in the United States. Traffic was so intense, special instructions provided that when a siren sounded on Oakland Pier Tower, all engines and trains within the district controlled by the tower were to stop and await a proper signal. the third, the electrified suburban lines via Seventh Street, Oakland; the fourth, steam trains via the Niles and Newark lines, while the fifth was used for yard engine movements between the Pier and West Oakland yard. Deep within the cavernous train shed at Oakland Pier. 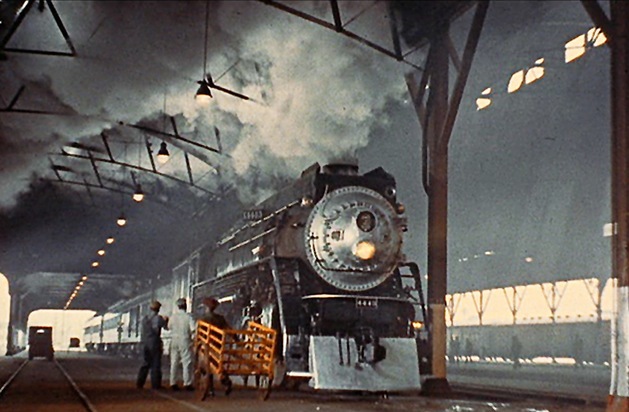 The traveler was enveloped in the sights, sounds, and smells of railroading…Southern Pacific style. 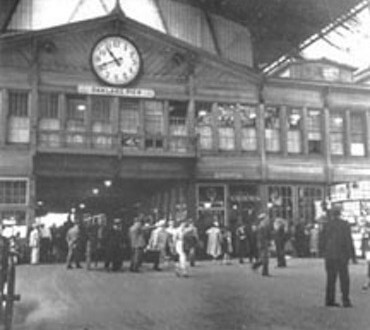 Passengers could buy their tickets at a small ticket office within the great sheds, but most travelers passed through Oakland Pier on either the first leg or last lap, of longer journeys. Day after day, a steady parade of trains departed Oakland Pier for destinations north, east and south of the city. Not only was Oakland Pier a focus of Southern Pacific passenger operations on the Shasta, Overland, and San Joaquin routes, but it was also the nerve center of the Western Division itself. In the offices at the head of the pier, and elsewhere in the complex, were the train dispatchers, crew dispatchers, division engineering and division officers, including train-masters and the superintendent. All good things have to come to an end, and the great Oakland Pier terminal was not immune to various services being closed down. The last ferryboat to San Francisco, the “San Leandro,” operated on July 29, 1958. 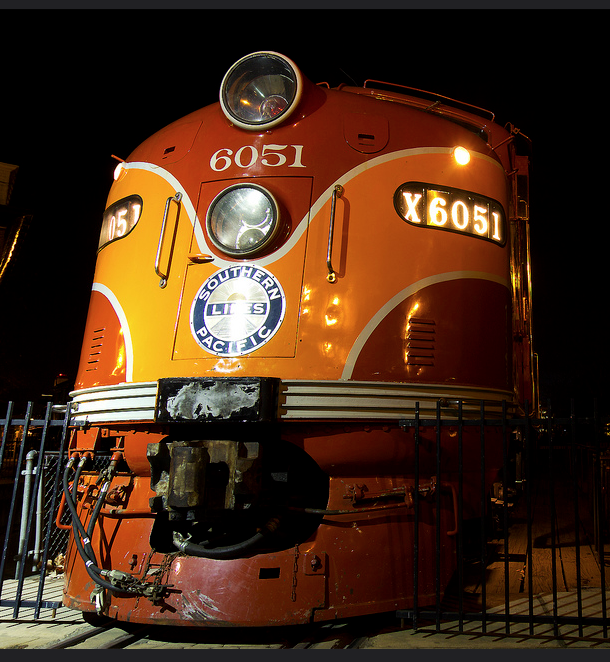 The last trains to use the Mole were # 19 and # 20, the “Klamath,” Shasta Route mail trains, in 1960. Following the golden age of Bay ferries in the 1930’s and the exigencies of World War II, the winding down of it all had set in shortly after. a “fifties” kid like me had to succumb to the charms of an exotic remnant of ferryboats in a hurry. With the coming of the 1960’s meant more bridges, the throes of growing up, and enduring various national tumults. After July 30, 1958, the bay would be ferry less until the 1964 startup of the Tiburon commute by the Red and White Fleet. Worse yet, we in the East Bay would have to suffer the indignity of accessing San Francisco by rubber tire only. That was remedied in 1974 with the opening of BART’s Transbay tube. 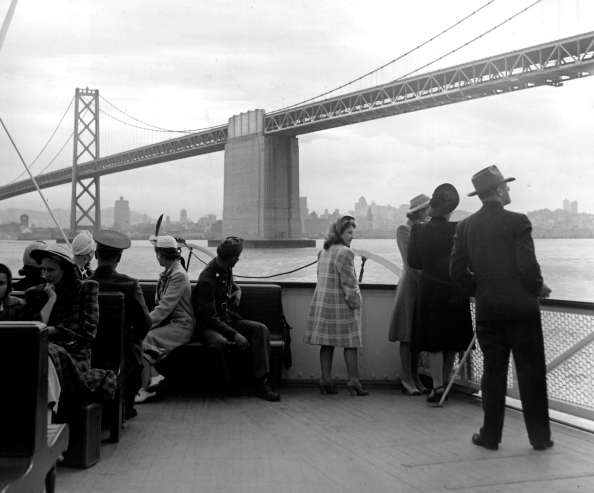 As late as 1937, the bay boasted a dozen ferry routes served by over 40 boats. By 1950 that number would be reduced to 4 routes and 13 boats. Interestingly enough, all the diesel powered vessels found new homes on San Diego Bay and north in Puget Sound. We were stuck with steamers, and that was fine with me. Combing the bay from the north, there was the Army Transport Service shuttle between Fort Mason and Camp Stoneman near Pittsburgh. It was discontinued after the end of the Korean War in 1954. The former Key System SAN LEANDRO, built in 1923, joined the Southern Pacific’s rail passenger shuttle between the Ferry Building and Oakland Pier. The YERBA BUENA (1927) was scrapped. Ferry service had been linking Martinez and Benicia since 1847, and it suffered a certain antiquity every since. By the 1950’s the line was chuffing along with two wooden sidewheelers, the CHARLES VAN DAMME (1916) and the CITY OF SAN RAFAEL (1924). By 1956 both had been condemned by the Coast Guard. For four months the only way between the two cities was via the Carquinez Bridge (then single-spanned!) – if you could get there. The “direct diesel” driveCARQUINEZ was hurried up by the pre-CalTrans Division of Highways. For six years this crossing was under state ownership and operation in anticipation of the 1962 opening of the new bridge. The CARQUINEZ was sold to Florida interests. Still very popular in the north bay was the workhorse Richmond-San Rafael Ferry. Three of the fleet, 240-foot steel hulled sisters built in 1924 – EL PASO, KLAMATH and RUSSIAN RIVER (ex-NEW ORLEANS), were casualties of the Bay and Golden Gate Bridges. The older SIERRA NEVADA (1913) was added after the war. All boats boosted the auto carrying capacity greatly as post-war traffic soared. Nevertheless, it seemed to be every family’s favorite outing. The 20-minute crossing featured a sit-down restaurant on the upper deck, where meals could be cooked to order…quickly! By 1956 a gloomy shadow was cast on us sightseers – a dreaded bridge nearing completion. On September 1, “old swayback” opened, linking the Contra Costa and Marin shores. The fleet was retired, their triple expansion engines “cold.” Today only the KLAMATH is still afloat, owned by Duraflame for use as an office in the Stockton port. It wasn’t over yet. Under the shadow of another bridge – the Bay Bridge – churned a trio of 300 foot Southern Pacific relics living on borrowed time under the exemption of a state law. Also joining Father Time was SP’s ornate Oakland Pier (the “mole), which opened in 1882 at the foot of the 7th street. Today it’s the site of the Matson container terminal. In its heyday, the Mole was the terminus for all mainline and interurban electric rail passenger operations. Adjacent to that was the subsidiary SP-Golden Gate auto ferry. By 1940 autos and interurban trains would be diverted onto the bridge. But to the delight of many, the ferrying of mainline passengers, tons of express, baggage and mail to and from the City would carry on until 1958. That this ferry operation was exempted from the “no-competing-within-ten-miles-of-a-state-owned-toll-bridge” law nostalgiacs showed up for the last ride). But during ordinary times, only arriving and departing bonafide train passengers were entitled to ride the ferry….legally! Simply, all you had todo was show up at the Berkeley station, and board any incoming train for the final five miles of the trip On weekday mornings, a diehard band of commuters could be found hoping and praying that one of the dwindling parade of mainline trains, such as a “local” from Sacramento, a mail train from Utah, or even the swift “City of San Francisco” streamliner from faraway Chicago, would be running on time. On weekends, we pleasure seekers, free from time constraints, would also show up at trackside. The charming Berkely station, with its “live” ticket selling you handwritten transportation, the PA announcing the train from Oakland 16th Street, Oakland Pier, with “ferry steamer” (an SP term) connection for San Francisco, was as good as it got. By the 1950’s, the loneliness of the 20-minute crossing was a reminder of how, twenty years previously, four different routes rounded Yerba Buena Island at the same time. With boats coming and going, make that eight abreast. On a weekday in 1935, some 75,000 passengers and 9,500 autos disgorged at the Ferry Building. All 12 wing wall style slips were in constant use. Sadly, in 1955 the terminal’s lone occupant would only be needing one of them, thank you. Ferry service had been maintained on a half-hourly schedule, but as train movements plummeted in the 1950’s, hourly service became the norm. As the end neared in 1958, the schedule was bunched into morning and evening shifts interrupted by a four-hour “lunch break.” There were virtually no train movements during that time except for a minor 3:00 arrival from Sacramento. It was a chilling omen that day when passengers were whisked onto an awaiting Greyhound bus for the final leg to the City. The ferry was “out to lunch” and the handwriting was on the wall. After all, SP opined in their press release, what could be better than modern buses affording you a view of the city skyline from the bridge? Until 1954, all three SP boats had 19th-century roots; these 300′ double enders could swallow at least 2000 passengers in one bite. 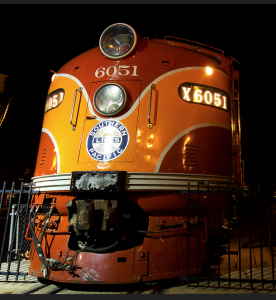 The BERKELEY spent her entire 60-year career plying the Oakland Mole crossing. When launched in 1898 she was a pioneer – a steel hull with a propeller drive. After retirement, she spent an unremarked decade or so as a curio shop in Sausalito. Today she’s moored at San Diego’s Maritime Museum, lovingly restored. Attracting as much attention was the legendary sidewheeler EUREKA. Following the close of the Northwestern Pacific Railroad’s rail ferry terminal in Sausalito on February 28, 1941, she was transferred to the Oakland run. Her superstructure was a 1922 rebuild but her hull and machinery dated back to 1890 when launched as the UKIAH. Her demise came just-like-that. At midnight in early 1957, after picking up “Shasta Daylight” arrivals at the Mole, the EUREKA’S crank pin snapped en route to the City. Repairs could have been minimal, but that was beside the point. The front office retired her, sentiment notwithstanding, and donated her to the Hyde Street Pier. Another “walking beam” vessel, the SACRAMENTO, was also a 1922 rebuild, but her hull and machinery were launched in 1877 as the NEWARK. In 1954 the SACRAMENTO was retired, stripped and towed south to Redondo Beach for use as a public fishing pier for a good stretch of years. Today she sits on the bottom of the ocean, splattered into a million pieces. Not quite out of the ferry business, Southern Pacific acquired the trim turboelectric steam SAN LEANDRO as a replacement. Since 1923 her tours of duty included the rival Key System, wartime shipyard service, and Army Transport Service out of Fort Mason. Interestingly enough, when shopped, the SAN LEANDRO would be the last classic ferryboat available. Sadly her tenure was brief. On July 30, 1958, SP would not only exit the ferry business, but a century-old bay tradition was brought down. On board ceremonies, included Arthur Fiedler conducting the San Francisco Municipal Band. Red and White Fleet’s HARBOR KING, still drawing occasional duty these days, served as an auxiliary press boat, anchoring port astern to accommodate press photographers. The SAN LEANDRO was maintained in “serviceable” condition for eleven years until September 8, 1919. That night an arsonist torched her at Pier 14, south of the Ferry Building. Keeping this, the world’s largest wooden ship extant afloat is the challenge. Her hull was recaulked and resheathed about five years ago. Shipwrights must now stay ahead of her dry rot problem slat by slat by slat. It makes me cherish all the more that day in 1955 when the EUREKA was just your everyday “point A to B” (albeit outlandish) unit of transportation, calling on a dying Ferry Building still opened to a waiting public sheltered from inclement weather. That day we waited for the 3:00 ferry call for Oakland, so we could connect to a train for Berkeley. As the redcap heaved open the screaming gate, we were greeted by this gleaming white anachronism. The EUREKA was ready for another crossing. The pulse of her walking beam engine drawing her huge side wheels will live with me forever. And yes, we were riding legally. The fare to Berkeley: 55 cents!